How To Create a Movement on In..
5 Tasks that will Get Your Bus.. 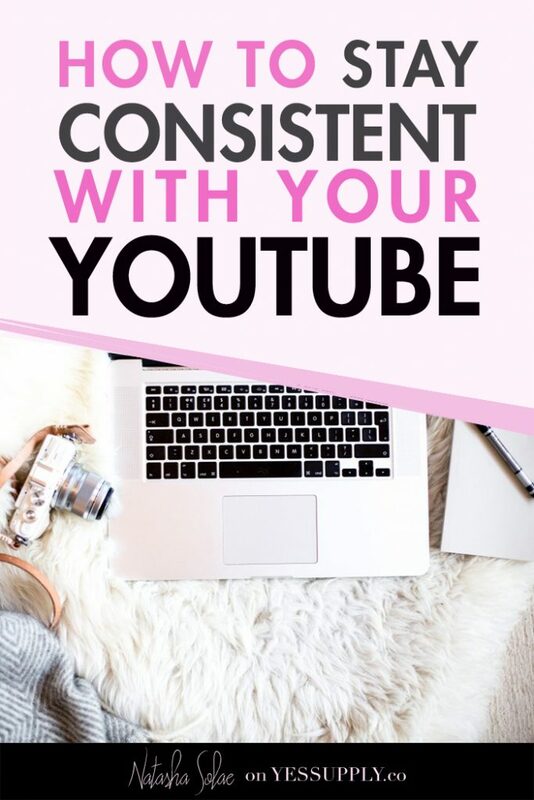 The key to having a successful Youtube channel is consistency–Yet so many struggle with time management and posting new video content on a weekly basis. When I sit down with brands and young female creatives around the world, the first thing we talk about is their content schedule. Truth is, the type of content you create or the fact that you got 100k views on a video six months ago is kind of minor in the grand scheme of things. It doesn’t matter how good your content is, the cool effects you spent hours perfecting or the $3000 camera you filmed your videos with if you haven’t posted a video in six months. In fact, if you want to build a successful, profitable Youtube channel with a loyal following, consistency is way more important than content. Want to know how to stay on top of your Youtube game? 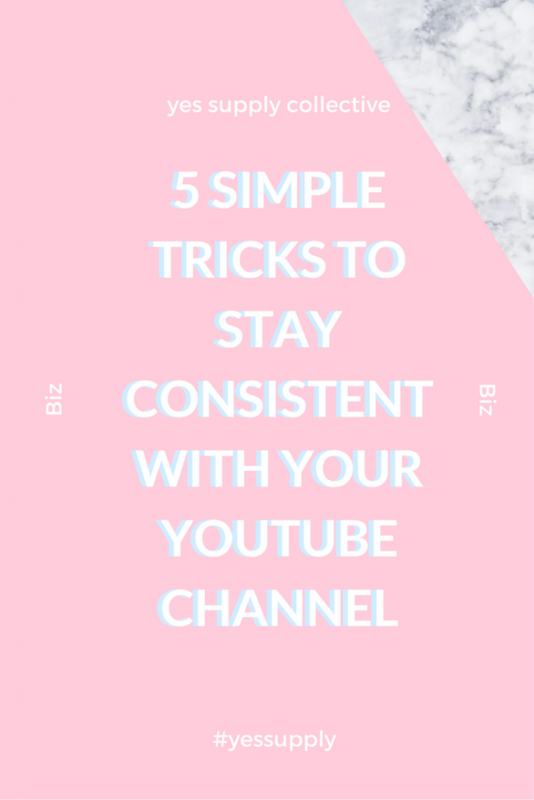 Here are 5 Simple Tricks to Stay Consistent with Your Youtube channel. First we need to make sure you are set up for success. We want your followers to know when to expect fresh, new content from you. That means you’re going to create a schedule for your followers, much like a TV series, and you’re actually going to stick to it. If you can’t commit to posting videos more than once a week, than just pick one day that you will stick to–no matter what–no excuses. As we discussed in my last post, your Youtube channel is like your own personal TV Network. If you want to grow your Network’s following, at the very least you have to take accountability and commit to providing content to your viewers on the same day every week. It’s really not any different from your favorite television show. Your peeps need to know when exactly to tune in. While some Youtuber’s also commit to a certain time on a specific day, studies have shown that just having a specific day is enough to appease folks tuning in on the world wide web. It’s not necessary but if you find it’s something your tribe loves or it helps keep you in line, then DO IT! Second, you need to make it clear to your followers and the people that stumble upon your Network aka Youtube channel when you’ll be posting this content. Thus, you will need to add to your banner the days you will be posting. 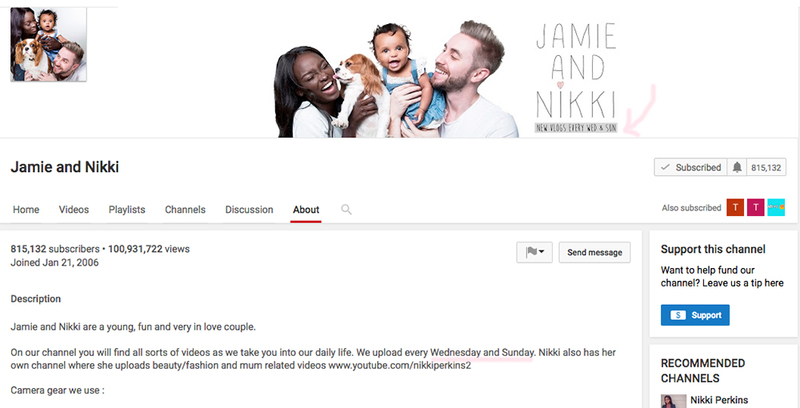 How Lifestyle Vloggers Jamie + Nikki branded their Youtube Channel. They post videos on Wednesdays and Sundays. You will also want to include it in other places like your channel description and / or your video description. It may also be good to remind your subscribers or newcomers at the start of each video the days you post. The biggest thing I’ve learned in 2016 about practicing commitment is that if you don’t write it down, it won’t happen. If you’re already using content planners to plan your blog or Instagram posts, then it probably won’t take much convincing for you to go out and get a content planner for your Youtube. If you’re not using a content planner–it’s time to get one. Unlike blog posts, youtube requires major setup time. Beyond doing your makeup, making sure your set looks good, making sure you’re in focus, checking audio and connecting monitors, you’ll probably spend at least an hour (sometimes two) of your time prepping for your Youtube video. Not knowing what video you’re going to film that day only creates frustration when you turn on your camera and realize you have nothing to talk about. If you use a content planner, and schedule which videos you’re going to film two weeks to a month ahead, you don’t have to waste your time and camera battery life, starting and stopping as you try to come up with an idea on the spot. This helps you stay consistent with your Youtube channel regarding content. To have a birds eye view of the type of content you’re sharing with your audience allows you to see what kind of storytelling your brand is partaking. It also helps your audience rely on that consistency to know exactly what type of information they will get from you. Along with getting a content planner to help you plug in and schedule all of your video ideas, you will want to write out a script for each video before you jump in front of the camera. This decreases the amount of time you spend recording yourself stumbling through thoughts. While some find writing down the script word for word a bit boring, I do recommend at least creating a simple outline to give your video some structure. Unless you took a college class in Improv, I’d suggest writing that script to make your videos less time consuming. Seasoned Youtuber’s have mastered recording videos in such short time blocks and they do it with a short outline. When you have a tight schedule, mastering time-management with your video marketing will help make things less time consuming so you can stay consistent with your youtube channel. While I love creating content for Youtube, I actually hate the filming process. I don’t like spending an hour-and-a-half doing my hair and makeup. Don’t judge me, it’s just the lazy girl in me that yearns to walk around the house with a hot cup of coffee and a messy up-do so I like to limit the glam process to as few times a week as possible. If you don’t want to reserve hours each day setting up for Youtube, your best bet is to film multiple videos in one day. Nobody really cares if you’re wearing the same makeup or shirt, but if it bothers you, just switch out your shirts and change your lipstick. Filming videos in batches is an excellent time-management trick that greatly reduces the time you spend recording videos. Seriously, you could dedicate two days a month to recording 2 videos each day and have enough content to spread across the entire month. Whenever I edit a video, more than often, I learn that the video I hoped would be 3 minutes long is actually 7+ minutes long. This is where having an outline or script really matters. When this happens, I cross reference my video with my outline to see where I can break up my video into smaller segments. Often times this means a seven-minute video can turn into two or three smaller videos. When you’re first starting out, it’s a good idea to limit your video to 1-3 minutes. Why? One way that Youtube measures the quality of your video is by audience retention. Audience retention is the percent of your video that viewers watched. In brief, how well does your video keep your audience interested. And yes, Youtube monitors that and gives you a report. 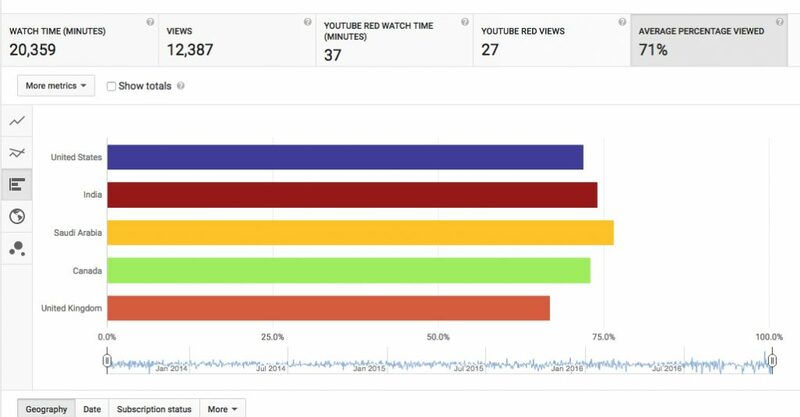 A screenshot of my audience retention rate for one of my top performing videos. The longer your audience watches, the better your video ranks. In fact, you can have a video with only 200 views outrank another video with thousands of views (within the same niche and with same title) just because the video with less views has an extremely high retention rate. So if you were thinking that you need thousands of views to be successful on Youtube, you really don’t. With good SEO and a small loyal following, your channel can grow substantially through high ranking, and be an excellent funnel to attract people to your products or services. My goal is to aim for a retention rate of 80% with each video. While that seems a bit high, I have been able to hit it on several videos which only catapulted my video from 300 views to almost 30,000 views through excellent ranking. Overall, you probably want to meet a 50-60% audience retention rate. If your audience is dropping off the first 10 seconds of your video, you will probably want to re-evaluate what your hook is to reel them in. When you don’t have a loyal following it’s easier to get people to commit to a video that’s short with valuable, actionable content. Not only will breaking up your videos help boost your retention rates per video, but it will also help you spend less time creating more content. This is a trick I learned from a friend that’s a popular youtuber with millions of views. She explained to me that at the end of the day, if you want to have a successful channel, you must be willing to post without making any excuses which is why you should have a backup plan for any last minute schedule changes. At the end of the day, stuff happens, right? Your best bet to combat those random weeks where you need a break, feel depressed, or are just plain too busy is to have an edited video always on the side, ready to go, that you can just post on weeks where you just can’t find the time or motivation to film. 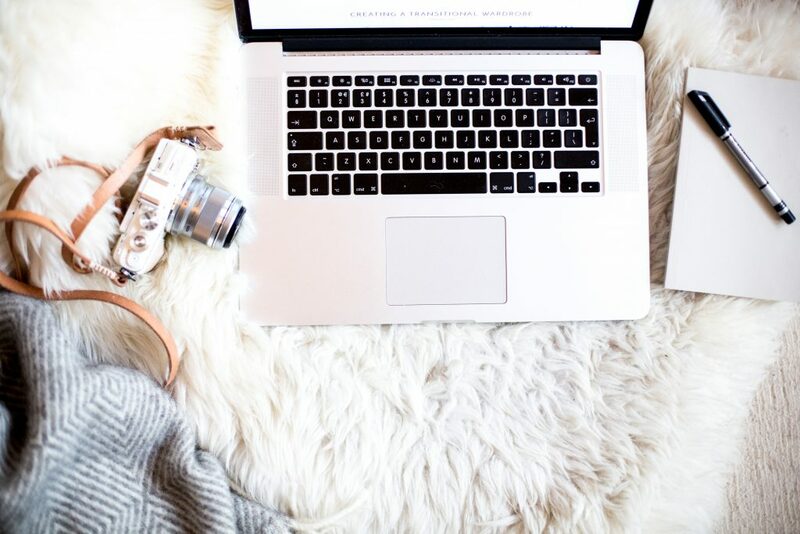 Managing a Youtube channel is a lot of work but it doesn’t have to be if you use time-management to help you stay consistent with your Youtube channel. By limiting the amount of time you spend on Youtube, you will decrease burn out, and frustration from not having your stuff together. Want more tips on growing your business, and creating six-figures while growing your online business? 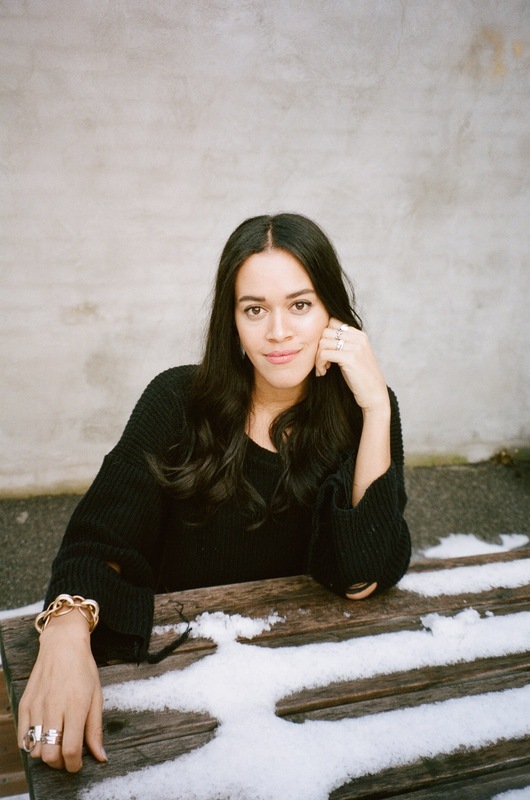 Natasha Solae is the Founder of GirlCEO, the only network dedicated to helping women build massively successful empires using video marketing, the Internet's most powerful secret. 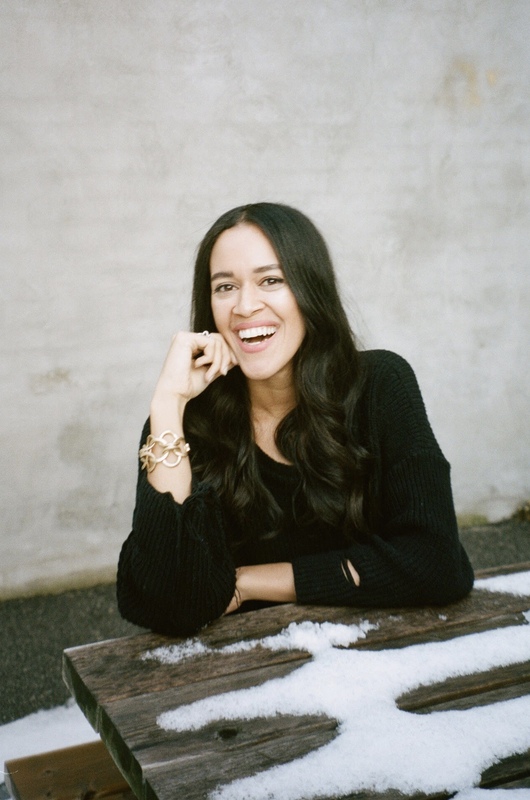 Check out her FREE course for female entrepreneurs looking to Get Started on Youtube » How to Get Paid to Be Yourself.